Sculpture in high relief in a dark grey schist coming from the valleys of Pakistan and Afghanistan. Iconography typical to the region: plump face, almond eyes and aquiline nose. Coiffure symbol of wisdom thanks to a chignon placed on the top of the head called krobylos with the hair spread out in well-ordered strands. An urna is placed between the eyebrows and there is the presence of a halo to the back. The halo is a legacy from north Indian tradition and it is linked to solar worship emphasized by the cosmic values of Buddha. The ears are threatening and damaged. Signs of erosion due to age but no visible restoration. Excellent traces of patina. 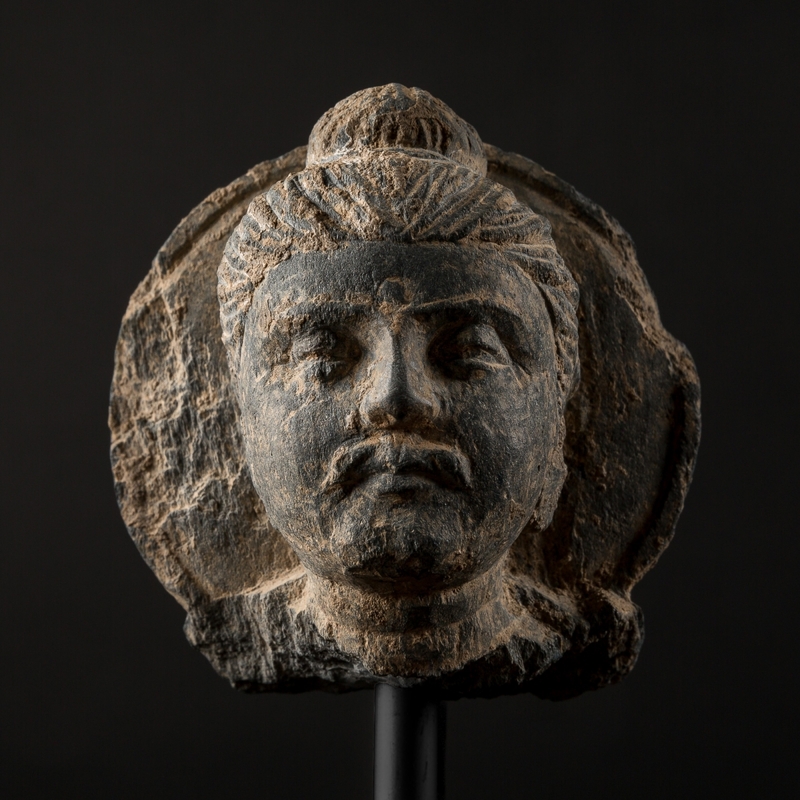 The art of the Gandhara, born on Indian soil and in the service of the Buddhist religion, uses iconographic elements drawn from the religious repertory and artfully combines them with the sculpting techniques introduced by the Greek soldiers from Macedonia then from Bactria, who had followed Alexander the Great. It was in that period that the first human images of Buddha appeared, adhering to the Greek beliefs that held the gods to be men and showing theological changes that reveal a new need for devotional images as a spiritual support.